What's the best way to stop a bank run? Well, ask Bankia. According to Spanish business daily Cinco Días, The Spanish bank - which is set for a multi-billion state bailout - has launched an initiative called "The amazing Spiderman". 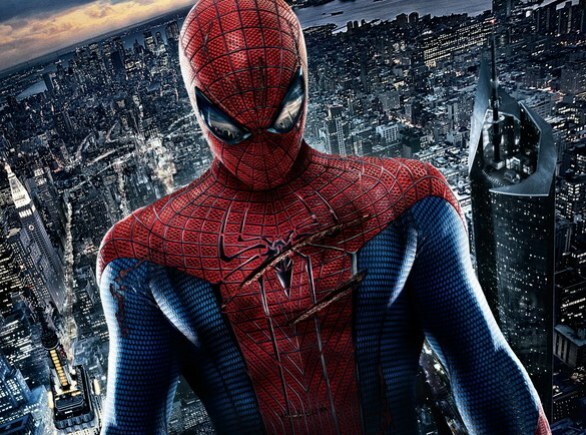 1,050 tickets for the new movie, "The amazing Spiderman" - with 50 of the tickets to the very première. The winners will be announced on 12 June. Beyond the troubled banking sector, there is another potential problem on the Spanish horizon that could be instrumental in how the euro crisis develops: the central government’s relationship with the 17 Spanish regions, and particularly its ability to keep public spending at the regional level under control. The 1978 post-Franco constitution designed Spain as a highly decentralised state. Regional statutes are treated as an integral part of Spanish law, and the regions legislate over a wide range of policy areas, from local infrastructure projects to culture and healthcare. As a result, they currently handle over 50 per cent of Spain’s total public spending. Earlier this year, the new centre-right government, led by Mariano Rajoy, was quick to blame the regions for Spain’s failure to meet EU-mandated deficit targets. 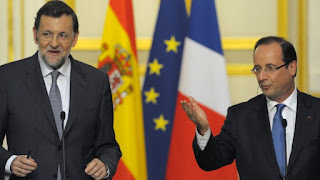 He had a point, but, ironically, some of the spendthrift regions – like Comunidad de Madrid and Comunidad Valenciana – have been led by the Prime Minister’s own party, Partido Popular, for years. More worryingly, earlier this month, excessive spending in these regions again forced Rajoy to revise upwards the country’s deficit. This shows just how difficult it will be for Madrid to control the regions, and therefore Spain’s public spending. Spanish regions have committed to a total of over €18bn (£13.6bn) of savings by the end of 2012 – almost half of Spain’s planned deficit reduction for this year. Given their past record, the regions are unlikely to deliver, meaning that the central government would have to pick up the slack. This would put further strains on Spain’s public finances, which will need much of the ammunition at their disposal to deal with potential future bank bail-outs. What can Rajoy do? The Spanish parliament has recently passed new legislation giving the government the power to take over the accounts of regions that look set to miss their deficit targets, and the tiny principality of Asturias may become the guinea pig for the new system. But will regions such as Catalonia or the Basque Country – which take their regional identity and independence extremely seriously – accept Madrid coming anywhere near their partial budget autonomy? It looks doubtful. The Basque Country is going to take the government to the Constitutional Court over planned cuts to health and education, while the Catalan governor, Artur Mas, has threatened to break his regional alliance with Partido Popular, unless Catalonia is granted greater tax autonomy. Spain could be heading for a major political showdown. In theory, Rajoy’s Partido Popular holds a sufficient majority to push through legislation without the support of regional parties. This is precisely what happened with this year’s budget, when the Prime Minister’s party rejected all of the over 3,000 amendments tabled by the opposition. However, the price of consistently taking such an inflexible stance may well be greater discontent in Barcelona and Bilbao. In general, the feeling is that Rajoy may already have reached the political limit of how much he can encroach on regional autonomy, and any further steps in this direction would require important changes to the Spanish constitution – for which there would be very little support. So what is the significance of all of this for the future of the Eurozone? First, those that put their hope in the Spanish government being able to deliver far-reaching deficit cuts, via equally far-reaching savings in the regions, are likely to be disappointed. Spain is not going to become France – a highly centralised country where the national capital rules supreme over public spending. Spanish regions will remain a liability, and pushing them too far may trigger a huge political backlash, which would hardly benefit the Eurozone either. But second, there’s a bigger lesson. If Spain faces difficulties in achieving more fiscal centralisation in its own country, due to political constraints, how much more difficult will it be for the single currency to achieve similar centralisation at the level of all 17 Eurozone members – considering its own number of different parliamentary and economic models, government structures, and cultural preferences? Just a thought. 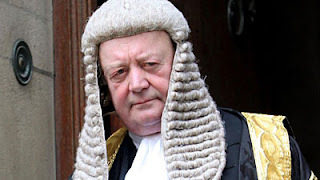 "The idea that they are all demanding a referendum on the European Union would be regarded as ridiculous, it would be out of sight as a public priority. It is the demand of a few right-wing journalists and a few extreme nationalist politicians." He said a referendum would create "absolute confusion" and that he couldn't "think of anything sillier to do...it would settle nothing. Particularly it would settle nothing with the more frenzied eurosceptics who keep believing that European bogies are under the bed." Hmmm. Looks like Ken is continuing arguments from ten years ago - and he comes across as very patronising. But he does have a point though: an in / out referendum would actually settle very little - and probably raise more questions than answers. In the next two weeks, we'll publish a briefing looking at these very issues. In particular, we'll look at the tiny issue of what actually happens on Day 2 if Britain did choose to withdraw (i.e. the in / out debate beyond the 'don't bother me with the details' approach that too often comes with this question). 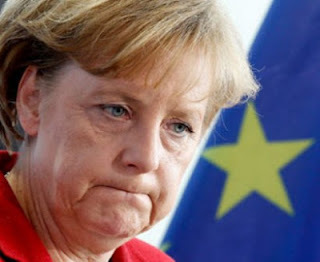 Update 1.45: It looks like Trittin has performed one of the fastest and sharpest u-turns of recent times, as he is quoted by Reuters earlier today as saying: "Merkel should stop blocking eurobonds" and suggested it could be a condition for his party's support for the fiscal treaty. This is also a matter of semantics though, as the Greens remain in favour of a limited form of fiscal burden sharing or debt mutualisation. It still illustrates the wider point however: eurobonds are in for a rough ride in Germany. Update 1.15pm: Die Welt has published a more detailed follow-up on the issue and the Green party has followed the stance of its oft senior coalition partner and also rejected eurobonds at the present time. 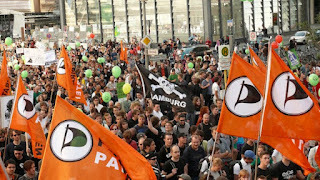 Green parliamentary co-chairman Jürgen Trittin said that while he agreed with the economic principles behind them, they were the wrong solution at this time, not least because it would require changing the EU Treaties. The paper states that both parties prefer an alternative, only partial, pooling of eurzone debt, possibly via a debt redemption fund. There's a school of thought out there - usually fairly uninformed - which has it that a German government that features the SPD (social democrats), could fairly effortlessly strike a deal with Francois Hollande over further fiscal integration, which would include, for example, eurobonds and greater ECB intervention. People arguing this point notes that SPD supports eurobonds, while doing fairly well in opinion polls. That should cut it right? "We oppose the uncontrolled pooling of debt… There is absolutely no need for general eurobonds". “I speak for [Germany] and not for France”. And there you have it from the horse's mouth...this will be a long, unpredictable debate in Germany. Most recent headlines concerning opposition to Merkel’s eurozone policies have focused on the anti-austerity positions of Hollande and his supporters, and at the more dramatic end, Tsipras and the radical Greek opposition. The ESM is to be permanent, with member states having no right to leave. The ESM Board of Governors, comprised of member states’ Finance Ministers, would wield decision making powers over policy and instruments. The Bundestag will have few opportunities for participation and control. The total size of the ESM “mega bank” will be €700bn, more than five times the size of the EU budget. Finance Ministers could agree on an indefinite increase. Member states have to pay €80bn in an-front cash contribution to the ESM, of which Germany’s contribution is around €22bn. 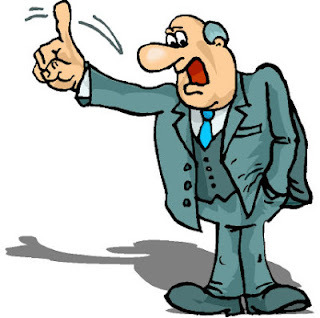 Any losses will be borne by taxpayers as the participation of banks and other private creditors is not mandatory. The ESM has no mechanism for debt restructuring and can therefore not be considered to be a form of emergency assistance. The group have also put out a slightly dystopian video warning of the dangers of a Europe built on debt. Lutz Goebel, Federal President of the Family Business Association, who in the past has compared the eurozone bailouts to the voyage of the Titanic, and urged the Bundesbank to seize the wheel of rescue before it was too late. John Hüdepohl from Bündnis Bürgerwille (Alliance for Citizens’ will) which campaigns for more input and involvement from ordinary citizens in the eurozone bailouts. Ultimately, despite Handelsblatt’s dramatic headline, this group and other similar constellations are not in a position to pose a serious threat to Merkel's policies at the moment. 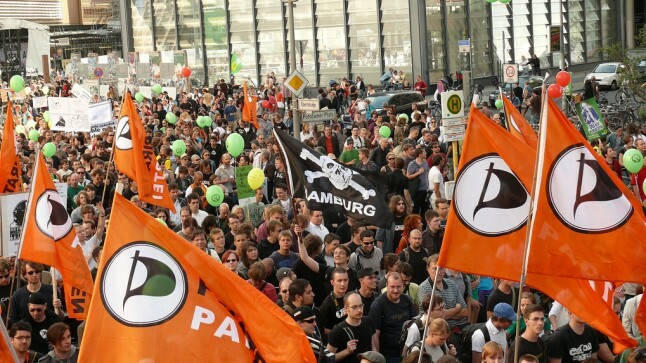 However, it shows that German domestic opposition has the potential to be uniting and organising itself, giving it a much better capacity to campaign for alternative policies. If Merkel appears to give in on ‘red-line’ issues such as eurobonds or greater ECB intervention, or if the eurozone is plunged into even deeper crisis – for example if there is no breakthrough in Greece’s re-run elections – expect such campaigns to pick up momentum. After the G8 summit, French President François Hollande claimed that he would "not be alone" in proposing Eurobonds at tomorrow's informal dinner of EU leaders in Brussels. But, who, exactly, are his bed fellows? Italian Prime Minister Mario Monti is undoubtedly a supporter of Eurobonds, along with former Economy Minister Giulio Tremonti. However, Monti has also repeatedly stressed that Eurobonds should not be "an excuse to relax budget discipline". From the US, Monti said that, for the moment, he would seek a mere agreement on the "evolution towards Eurobonds." (whatever that means). Monti is also likely to prioritise his own proposal: exempting public spending on certain "strategic" sectors from the EU's deficit and debt rules - a proposal which no doubt will rub Angela Merkel completely the wrong way. Monti is unlikely add fuel to the fire by also insisting on Eurobonds. 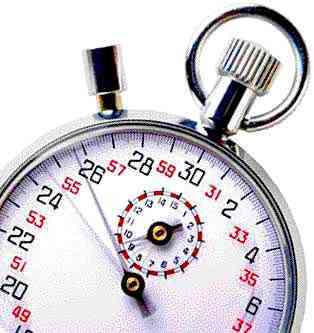 The most important thing is to take decisions that can be enacted in 24 hours. We can't enter debates [about the creation of Eurobonds] that can last for years. Quite right Rajoy. The Spanish PM will not want to take on Merkel over the proposal either - his main concern is the future of Spain's banking sector. As speculation mounts that Spain may be forced to tap the eurozone's bailout funds to deal with its banks, Don Mariano wants Germany on side. We think that it's only when there is an increased level of convergence and discipline that Eurobonds can appear as something credible. [Eurobonds should not be seen as] an invitation for irresponsible fiscal behavior or having some kind of moral hazard. Growth financed by debt? Those are the recipes from the day before yesterday. The arguments that are put forward by France's new president François Hollande are nonsense and got us into this whole mess in the first place. Or the prudent Finns? Hardly. Well, there's one: David Cameron. At least this time around, Cameron will not have a French President calling him an "obstinate kid" and asking him to stop interfering in eurozone politics. Regular readers know what we think of the UK government's peculiar habit of lecturing the eurozone on the need to move to a full fiscal union (meaning eurozone governments completely running over their own electorates). Well, over the weekend, the Coalition moved from dropping hints to - it seems - issuing outright instructions. 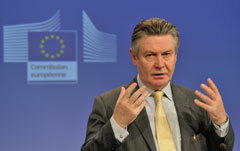 "You have to have something which creates a fiscal accompaniment to monetary union. Whilst I have a huge amount of sympathy with German taxpayers and German politicians who are reluctant, understandably because Germany is the paymaster of the European Union, to entertain these ideas, I fear that they are unavoidable. It is not sustainable to believe that the eurozone can thrive through fiscal discipline alone - it also has to, at some level, include an ability to either share debt or to deal with shocks in one part of the system or the other through fiscal transfers." "The eurozone needs to follow what I described a year ago as the 'remorseless logic' of monetary union towards greater fiscal integration and burden-sharing. I mentioned eurobonds as one possible mechanism, and there are others." "We now have to send a very clear message to (the Greek) people - There is a choice, you can either vote to stay in the euro with all the commitments you have made, or, if you vote another way, you are effectively voting to leave." "I don't think David Cameron's posturing helps at all, I think it just makes it worse"
"In the end... somebody has got to persuade Germany that this is a catastrophe for Britain, Europe and the world and that Germany has got to change course...The problem is, the German people went into the eurozone 10 years ago on the clear promise that they weren't going to bail out Italy and the central bank wasn't going to play this role. Both things have got to change." 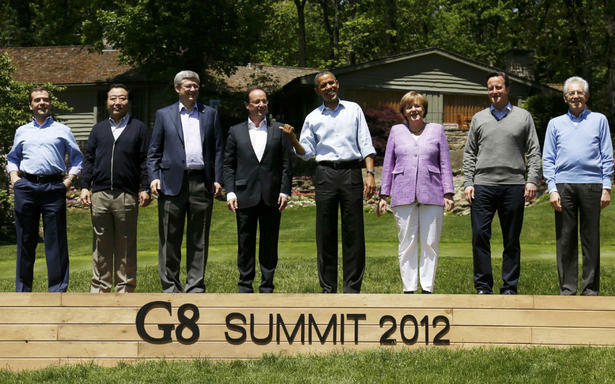 "Two years ago, at the summit of the G-20 leaders in Toronto, Merkel was able to enforce the requirement that developed countries should cut their budget deficits by 2013. She was supported by the then newly elected British Prime Minister David Cameron. In the meantime, Cameron’s austerity policies led Britain into a recession, with a corresponding loss of credibility." We get it. British euro lecturing is for domestic consumption, but is this really where Cameron wants to be in Europe (the perception isn't exactly helpful)? We're not working on the basis of a scenario of Greek exit. It's Ascension Day today, and the EU institutions are closed. Still, someone at the European Commission felt the need to say something on Greece. "A year and a half ago maybe there was a risk of a domino effect. But today, there are [people] in the European Central Bank, as well as in the Commission, working on emergency scenarios if Greece shouldn't make it." "A Greek exit does not mean the end of the euro, as some claim." "[The European Commission] is working on scenarios to keep Greece within the eurozone, not to make it leave." "We knew that Greece was cheating [on its public accounts]." What do a British Conservative PM and a French Socialist President have in common? David Cameron will have his first face-to-face meeting with newly elected French President Francois Hollande today, at a G8 summit in the US. There has been some fuss about Cameron and Hollande not getting along. 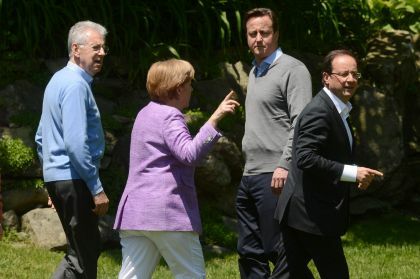 Cameron snubbed Hollande during a visit to London. And, most importantly, one is a French Socialist, the other a British Conservative. They must be each other’s diametrical opposite, surely? Both are trying to cut deficits: Yes, despite all the anti-austerity rhetoric, Hollande is trying cut spending too (as we’ve noted, the difference between the economic plans of Hollande and the ousted Sarkozy was paper thin). As his new economy minister Pierre Moscovici put it, “Hollande has always said that we should tackle state debt and reduce deficits”. Hollande wants to achieve a ‘balanced budget’ by 2017, Cameron wants to eliminate the UK’s spending deficit by 2015, albeit both are likely to fail. Both have threatened to veto an EU treaty: In December, Cameron vetoed an EU Treaty change to impose greater fiscal discipline in the Eurozone. Equally, Hollande has implicitly threatened to veto the free standing ‘fiscal treaty’ (itself a result of Cameron’s veto), unless a clause on various fiscal stimulus measures is added. The rationale in each case is of course different but both have clashed with Germany’s view of the solution to the crisis. Both have called for the ECB to become the euro’s lender of last resort: Causing half the German population to choke on their morning pretzels, Cameron and Hollande have both called on the ECB to do far more to “share the burden” of the Eurozone crisis through monetary activism, which probably means the ECB buying hundreds of billions of government bonds (which Cameron has endorsed implicitly, Hollande explicitly). 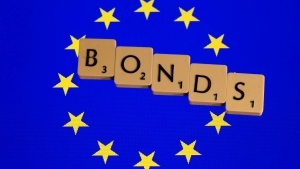 Both have toyed with the idea of eurobonds: In the past, both have called for a discussion on the eurozone moving to full debt pooling via eurobonds. Cameron called for it again yesterday, while Hollande hasn’t mentioned the idea since August last year and seems to have backtracked somewhat (his ‘project bonds’ are something different). Both leaders have cabinets with ministers who opposed the flagship Lisbon Treaty/European Constitution: Laurent Fabius, new Foreign Minister, campaigned successfully for a “no” vote to the European Constitution in in 2005, while his UK counterpart William Hague, and most of Cameron’s cabinet (Ken Clarke excepted) opposed both the European Constitution and its successor the Lisbon Treaty. So what’s my point? Of course, there are a whole range of disagreements between the two leaders. But two observations: first, the ‘austerity vs. growth’ debate is fundamentally false – even the proclaimed anti-austerity champion realises that public spending needs to be cut (at least in theory), while everyone is in favour of ‘growth’. The debate is on how to get there. Secondly, the line between the alleged ‘Eurosceptic’ and the alleged ‘pro-European’ suddenly becomes awfully blurred (who’s who again?) 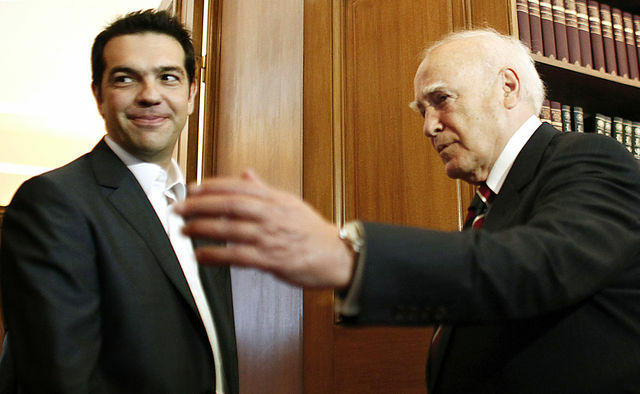 as both, obviously to different degrees, have problems with the status quo in the EU/Eurozone. A story seems to have taken hold today that suggests the ECB may be indirectly trying to push Greece out of the euro by reducing its liquidity support to its banks which, the theory goes, would threaten a banking collapse and cause Greece to leave the euro in order to use its own central bank to support its banks. This seems par for the course with many of the headlines doing the round at the moment, but after some further inspection we're not certain that any decrease can really be seen as the ECB trying to force Greece out. The story started from an overnight report from Dutch daily Het Financieele Dagblad which claimed that, according to unnamed central bank sources, the ECB is winding down its lending to Greek banks due to concerns over their capital levels. According to the article the liquidity provision from the ECB to Greek banks has dropped by almost half since they last publicly recorded level of €73bn in January. Now, the report could be accurate but there are some caveats here which need to be noted. First, ECB lending to Greece was always going to fall post restructuring. Most of the €73bn borrowing by Greek banks from the ECB uses Greek bonds as collateral, when these were written down by over half, the banks were always going to have much fewer assets to post as collateral. This problem has also been exacerbated by the fall in the value of the new Greek bonds, which would have ensured that they were subject to huge haircuts in value at the ECB’s liquidity operations. So, the Greek banks would probably have always had to cut their borrowing from the ECB simple due to collateral constraints. The slack will naturally be taken up by the ‘Emergency Liquidity Assistance’ ( ELA, provided by the Greek Central bank under less stringent capital requirements, see here for a full discussion) resulting in a decrease in the level of lending by the ECB directly to Greek banks. Some lending would have been maintained by the €35bn in guarantees which the EFSF provided to help insulate the ECB against additional risk. However, these fall far short of covering the entire €73bn borrowing by Greek banks from the ECB (against which they would have needed to post around €100bn in collateral due to the large haircuts which the ECB applies). One of the motivations for the ECB's supposed reduction in lending is the slow progress in the bank recapitalisation. This could well be true, however, the fact is that without this new capital the banks will continue to be short of collateral to use at the ECB, meaning lending must take place under the ELA in the interim. Lastly, the size of the balance sheets which Greek banks need to service would also have been reduced by the restructuring meaning they may need less liquidity than before. In summary, a fairly large decrease in ECB lending to Greek banks would have been expected in the aftermath of the restructuring, even if it were just moved onto the ELA. It could in fact have been motivated by constraints on the banks themselves rather than the ECB. Now, that’s not to say that the ECB is not annoyed by the lack of progress in the Greek bank recapitalisation but we all know that the correlation of these events does not mean causation. Things will be clearer when the full figures are released, but until then we’d be very wary of suggestions that the ECB is trying to force Greece out the euro, it’s not like the eurozone is short of dramatic headlines anyway. 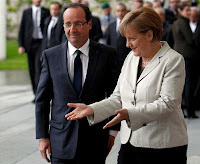 After being hit by lightning and left soaked by a rain shower during his first day as French President, you'd forgive Francois Hollande for thinking that something would go seriously wrong at his first meeting with German Chancellor Angela Merkel. However, as expected, yesterday's meeting wasn't overly exciting. "Our method will be to put all the ideas on the table and then see what legal implications they can have." "We have different approaches to achieve growth, but we will share our ideas and see what the different paths to stimulate growth are." The upcoming meeting of EU leaders on 23 May could be the first real test. For the moment, a new poll shows that half of French think their new President will not be able to twist Merkel's arm on the fiscal treaty. "We’re ready to do everything we can…to help Greece structurally." "People in Greece need to know that we will help them – through growth-enhancing measures, through support to [Greece’s] economic activity – to ensure their presence in the eurozone." Is this a signal that Germany could be willing to give Greece more time to meet its deficit targets? Too early to tell. German Finance Minister Wolfgang Schäuble also ruled out re-negotiating the conditions attached to the EU-IMF Greek bailouts in an interview with German radio Deutschlandfunk this morning. The most important outcome of the meeting was always going to be the tone it struck. Clearly, it was conciliatory, the focus was always on compromise. It will be interesting to see if this holds throughout the upcoming negotiations on Greece. Those expecting a clash between an irresistible force and an immovable object (the much maligned growth vs. austerity debate) may yet be disappointed. On an extremely busy day in the eurozone, French President François Hollande has reportedly had a curious - and somewhat scary - accident on his way to Berlin. 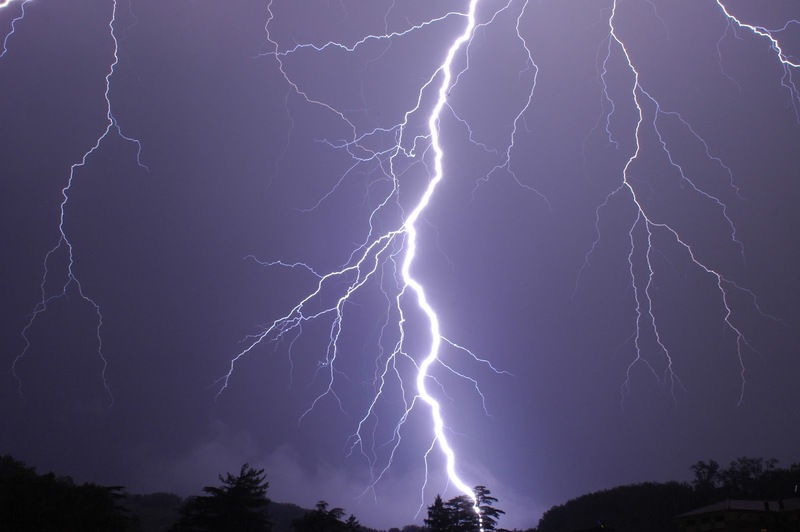 His plane was hit by a bolt of lightning, and had to return to the military airport of Villacoublay - where it had taken off some 40 minutes earlier. Therefore, Hollande had to jump on another plane. He's now flying to Berlin, but will be late to his first meeting with German Chancellor Angela Merkel. P.S. : We're pretty sure that the Chancellor will forgive Hollande's tardiness, given that he just appointed Jean-Marc Ayrault - who speaks good German and is widely seen as a 'Germanophile' - as the new French Prime Minister. Four out of five Greek voters still committed to the euro: Will the Greek anti-austerity parties blink first? There’s a paradox at the heart of the Greek euro debate: voters have comprehensively rejected EU-mandated austerity – parties that are (more or less) in favour of ripping up the bailout conditions mustered 68pc of the votes. And yet, according to a new poll, 78pc of Greeks are still in favour of the new government doing “whatever it takes” for the country to stay inside the Eurozone. On one level, this phenomenon is an extreme case of having your cake and eating it. Clearly, Greece needs root-and-branch reform if it’s going to have any hope of remaining inside the euro, and naturally, Germans and other creditors will want guarantees in return for putting up cash. But this paradox may also hold three clues to Greece’s future inside the eurozone. First, it illustrates the conflicting view inside Greece of "Europe". The country has been an EU member for 31 out of 38 years as a democracy (at least in modern times). EU membership is still associated with stability, prosperity and democracy, which explains why four out of five Greeks remain committed to the euro. Therefore, when German ministers, central bankers and others dare Greece to tear up the bailout deal and face an imminent euro exit, they also dare Athens to risk all which marks the break from its chequered past of colonels and instability. Rhetoric aside, are Greek parties really willing to pull the trigger? At the same time, though, on the current austerity path there must be a tipping point for Greece, when the euro and/or the EU becomes predominantly associated with a whole range of negatives, including undermining democracy, meaning Greece will almost certainly decide to leave. Though we’re not there yet, there are plenty of signs already. Secondly, the Greek population is in some ways rational in its opposition to a euro exit. Yes, the country is stuck with a hopelessly overvalued currency. Yes, it was a mistake to allow it in and the rest of it. But whether staying or going, Greece is in for a very rough ride. Just to illustrate: the Greek banking sector is completely reliant on the eurozone for recapitalisation and liquidity (via the EFSF and ECB). If Greece exited, the newly independent Greek Central Bank would be forced to fill this void by essentially printing huge amounts of money, perhaps equal to half of Greek GDP. Hyperinflation would be a real threat as would the collapse of the banking sector. Would SYRIZA and others dare to risk it? Thirdly, the Greek population isn’t entirely irrational in its opposition to the EU/ECB/IMF programme either. This programme is based on unrealistic assumptions and is choking off any chance of growth. This is not an endorsement of debt-funded growth à la Hollande – which is what put Greece in this mess in the first place – but of giving Greece some flexibility to enact structural reforms, for example via a full restructuring (which is now much harder due to the ‘private sector involvement’ in the second bailout). If the Troika could loosen the reins slightly, and a new Greek government use that to boost chances for growth while also and saving face at home, perhaps there’s a compromise to be had between Greece, Germany and the IMF – and Greece can live another day inside the euro. Though the euro still would have plenty of issues, at least, this could give Greece time to recapitalise its banking sector and achieve a primary surplus, both of which would make managing an exit easier. In any case, in the ongoing game of chicken between Germany and the Greek anti-austerity parties, given the huge stakes, it may well be the Greek parties that blink first. 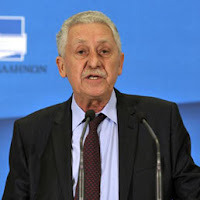 Negotiations to form a coalition government carried on over the weekend in Greece, and are due to continue this evening - in parallel with the meeting of eurozone finance ministers in Brussels. Syriza leader Alexis Tsipras' recalcitrant stance has not gone down well with Democratic Left leader Fotis Kouvelis. He just told Greek Real FM radio that he has no intention of cooperating with Syriza, even after new elections. The move by Syriza to call for cross party talks tonight could very well be little more than political posturing. Following the break-down of talks over the weekend Tsipras didn't come off too well, with all the other parties blaming him for the lack of progress. The recent polls showing that 78% of Greeks want to see a coalition which supports the euro could have played a role in convincing him to come back to the table - if only to save face and look to be participating constructively ahead of the new elections. The situation remains very uncertain, but the general feeling is that tonight's round of talks with President Papoulias could really be the last chance to avoid new elections. Essentially, for this to happen, Kouvelis has to U-turn on his electoral promises and accept to enter a coalition with New Democracy and Pasok. However, the latest developments seem to suggest that new elections could, at this stage, be inevitable. - German Foreign Minister Guido Westerwelle speaking in the Bundestag on Friday. Hear hear! As we have flagged up repeatedly, because of its flawed design, the EU budget is particularly prone to mis-allocation of resources and poor project selection. Seriously, for how much longer can Europe afford having such an economically irrational policy at the heart of its common project? Incidentally, if you're around Brussels tomorrow, we're organising an event on this very question, i.e. on how the EU budget should be reformed. The Spanish government held a press conference this afternoon finally laying out its plans for dealing with its significantly troubled banking sector. As usual Spanish Prime Minister Mariano Rajoy dodged the limelight and left the unenviable task of presenting the proposals to his Deputy, Soraya Sáenz de Santamaría, and Finance Minister Luis de Guindos – despite this being par for the course with the new government we still can’t help but feel that it fails to inspire confidence. · Two independent auditors will carry out an evaluation of all the real estate assets held by Spanish banks – the Deputy PM termed this “an exercise in transparency”. Open Europe take: We have been calling for this for some time, so believe it is a positive step. However, we have seen that similar tests have been fudged in the eurozone and Spain before, so it is very much wait and see. Taking an adverse scenario and ensuring these assets are written down to their real values is key – if they start posting falls in the future it will reignite the uncertainty surrounding the banking sector. The Spanish government also failed to mention that, at least according to the Spanish press, de Guindos was going to be asked to hire independent auditors by his eurozone counterparts at the meeting of eurozone finance ministers next week. · By the end of 2012, provisions to cover against losses on real estate loans considered as ‘non problematic’ will have to increase from 7% to 30%. Open Europe take: This seems far too low. 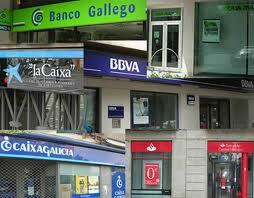 Given comparisons to Ireland we expect real estate prices could fall by another 35% in Spain. Additionally, this move seems to be skipping a step – Spanish banks already have €136bn in ‘doubtful’ loans against only €54bn in provisions, surely provisions against these very risky assets should be increased first or at least in tandem. · In absolute terms, this means an increase of around €30bn. Open Europe take: Again, far too little. We predict that Spanish banks would need to at least double their provisions, taking them up to around €100bn. Similar estimates abound, with RBS calling for an additional €100bn and Roubini Global Economics suggesting it could go as high as €250bn over the next few years. Meeting the Basel III capital requirements will put further strain on the sector. 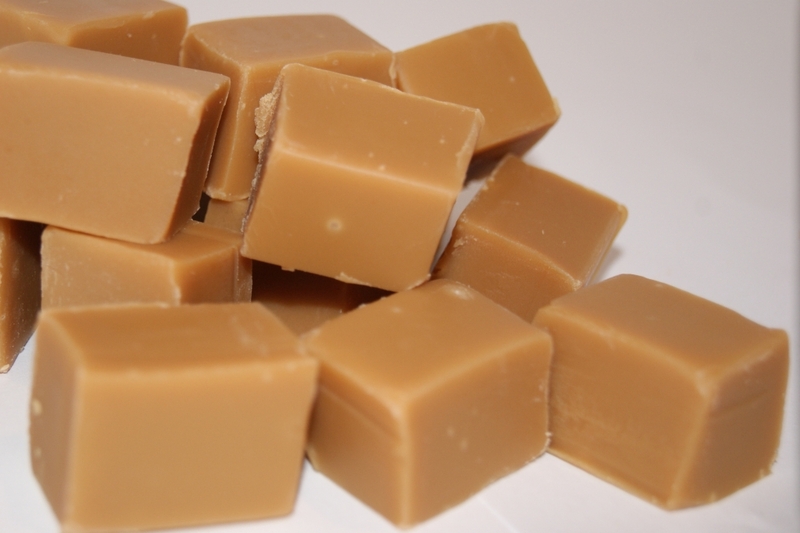 · Banks will be allowed to get money from the FROB, but will have to pay 10% interest on it – Spanish Economy Minister Luis de Guindos stressed that this money cannot therefore be seen as state aid. Suggested maximum use of public funds would be €15bn. Heavy use of ‘contingent convertible capital’. Open Europe take: This seems to be poorly thought out and based on an ideological reaction. Clearly the government is keen to avoid being seen to bail out banks, and rightly so. However, the banks tapping these funds will be those locked out of the interbank funding market (due to high rates), punishing them with 10% interest will make this recourse worthless. Any use of public funds should come with strong conditions but better to focus on letting some banks fail and be wound down in an orderly fashion, while forcing those that take funds to produce ‘living wills’ and give the state equity warrants. Contingent convertible capital can be useful but does not fundamentally solve the problems facing the banks, again it simply delays dealing with the problems and kicks in as a last resort safety mechanism – will do little if provisions are shown to be woefully small or valuations far too high. · Spanish banks will be obliged to transfer real estate assets into ad hoc societies tasked to sell them on the markets – i.e. the ‘bad bank’ that dare not speak its name. Open Europe take: Potentially a large burden for the state, but given the breadth and depth of the problems across the sector some form of ‘bad bank’ scheme looked hard to avoid. The key here will be transferring the assets at realistic values so that they are sellable or can be written off. The Irish experience with NAMA makes this point clear – a bad bank stuck with uncertain assets can be a huge burden to the state. Furthermore, it could also distort the recovery of the sector as a whole, if the overvalued assets pile up on state books it will be hard for the remaining market to adjust – something which is necessary if the Spanish economy is to rebalance and recover. The market response to the proposals has been lukewarm at best with Spanish borrowing costs rising slightly and the shares of many Spanish banks falling sharply. There are some positive steps in the proposals and we will reserve full judgement until the complete package is announced and the stress tests have been detailed, however, it again seems to be a step short of what is needed. The key to tackling these banking sector problems is doing so decisively and in one swoop, rather than pushing the problems to tomorrow. Incremental adjustments increase uncertainty and expose the state to a longer and more volatile burden than needed - given the size of the Spanish economy, that is something which the eurozone cannot afford now or in the future. “Over the next few years prices in Germany will rise much faster than before. Our venerable Bundesbank, the sacred guardian of price stability, will do nothing about this since it considers it to be ‘manageable’”. “[inflation] will above all hit workers, employees and pensioners. Precisely those who kept a cool head and ploughed on through the crisis. This is unfair. 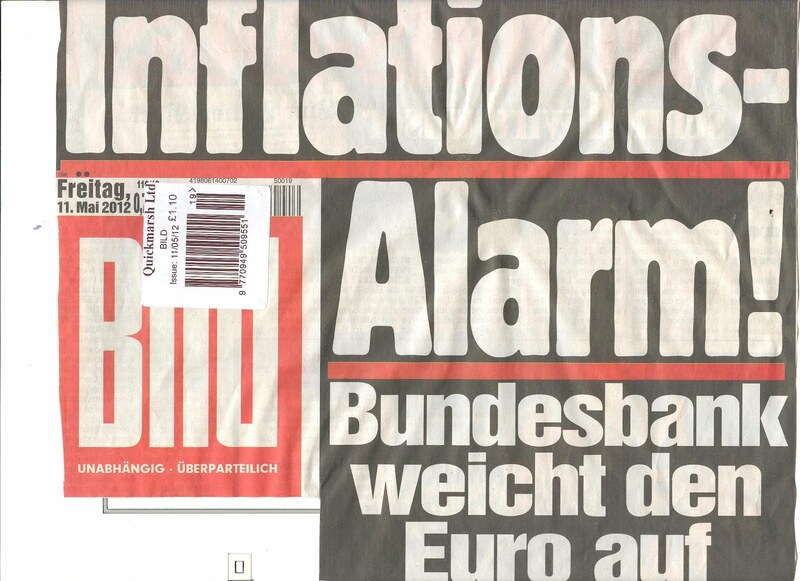 It gnaws at our trust in money and our major institutions, in politics and central banks… since Germans have bitterly experienced it themselves they know that high inflation ultimately breaks down every society”. It wasn't only Bild though. The man himself, Weidmann, moved swiftly to deny the reports, claiming in an interview with Süddeutsche that this was an “absurd discussion”. He clarified that keeping inflation below 2% in the eurozone as a whole meant that “in some cases” German inflation would be higher, but that “we will ensure [in the ECB’s governing council] that inflation in Germany will not run out of control. Citizens can rely on the vigilance of the Bundesbank”. This is one national core belief you don't mess with.